The Odyssey Svelte Titanium spindled pedal is one that we first saw in 1991 as the Titan Racing Titanium pedal. The Titanium Svelte pedal is identical, except that it has the Odyssey logo rather than the Titan logo. It is available with the cage anodized in five colors, Blue, Black, Grey, and Purple (Lavender). Reading about the Titan Racing model further in this section will give you the specifics of this pedal set. The weight of a pair of Odyssey Svelte Titanium spindled pedals is 218 grams. 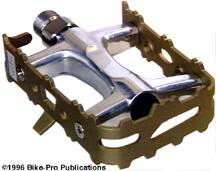 Odyssey also has a Cro-Moly steel spindle version of the Svelte pedal. Everything else is identical except that each steel spindle weighs 60 1/2 grams, while the Titanium version weighs 34 1/2 grams. The Cro- moly Svelte pedal is available with the cage anodized in five colors, Blue, Black, Grey, and Purple (Lavender). The weight of a pair of Odyssey Svelte Cro-moly spindled pedals is 270 grams.